SubRosa is a space where many possibilities unfold that range from happenings during open hours to music shows to art openings to film showings to educational events, like Free Skool classes. Here is more about Free Skool Santa Cruz from the Free Skool website (where you can also access the calendar to see the full range of offerings). 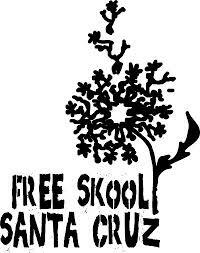 A radically different approach to living and learning, Free Skool Santa Cruz is a grassroots educational project with classes held in homes, social spaces, and parks. It is an opportunity to learn from each other and share what we know, with a focus on self-reliance, community, do-it-yourself culture, and creating a new and beautiful world. The project strives to blur the lines between teacher, learner, and organizer, while posing a direct challenge to dominant institutions and coercive power structures. Part of creating a new world is resistance to the old one. Through this project, we want to change the way we learn, teach, and relate to each other. Mindful of the environmental and social crises currently facing the world, this class seeks to find a creative response with the concept of "zero waste." The teachers will give a short history of the concept. From this theoretical background we hope to play with concrete actions, exploring limits, and emphasizing experimentation. We hope to engage in responses that are personal day-to-day action from the ground up and/or collective projects of transformation. Course is in two-parts: first class will be discussion and brainstorming; second class will be reflection, sharing of actions and moving forward. Based on the principles of Non Violent Communication, this class offers concrete tools and examples of how to parent from the heart. We will practice methods of respectful interpersonal communication that both addresses and aims to meet the needs of every family member. These methods are useful from toddlerhood through the teen years. Resolving challenges peacefully is a hallmark of parenting from the heart with the goal to create freedom and joy within the family. Requirements: This class is open to parents of children of all ages, expectant parents, those considering parenthood, and anyone who has a child in their life. A historical study of early Christianity focusing on the critical period following the death of the historical Jesus to the formation of the faith's major tenets at the Council of Nicea in 325. We will discuss questions like: how do the intellectual descendants of revolutionaries become so orthodox and rigid? Why did Christianity win out over all the competing belief systems? What were the "Lost" Christianities like? We invite you to come to SubRosa other times as well. And don't be deterred from stopping by if SubRosa is closed a bit more this month. In September our hours will be more regular again, as some of us have been traveling around a bit in August.